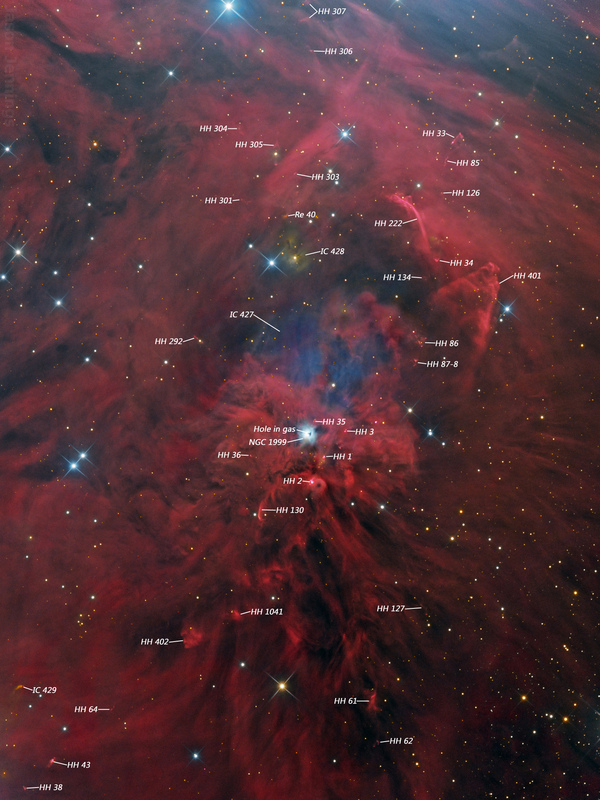 Comment	 Located in the constellation Orion, this image shows a portion of Orion's giant molecular clouds known as 'Orion A' where new stars are forming. At the center of the image is reflection nebula NGC1999, which contains the young star V380 Orionis. A small, triangle shaped patch of dusty material is seen in silhouette against the reflection nebula. NGC1999 lies at the center of a network of nebulous filaments which flow outward. The area consists of several powerful jets of gas which are often the first visible manifestations of the birth of young stars. These jets punch holes through the opaque clouds in which the star is formed, holes through which the light of the new-born stars can escape to produce what are known as reflection nebulae.